BBC’s revelatory new documentary on ‘Sharks’ is getting praised around the world for its thoughtful presentation of a traditionally maligned group of animals. Personally I found it so refreshing to be apart of a series that explores something more than shark’s skills as predators or the occasional negative interactions rays have with humans. Those of us that work with these animals are growing weary of their constant portrayal by the media as brutish fish with big teeth and serrated spines. Luckily this recent series by the Natural History Unit is part of a catalyst for change and the public seems to be responding positively. For this specific show the BBC was interested in discussing some of the work my team is conducting on social behaviour and social networking in manta rays. Like so many media giants, they gravitate to notoriously controversial and hotly debated topics like animal intelligence. Now, I am not a cognitive ethologist by training nor am I interested in arguing the nuances of this deeply complex field. I am interested in getting people to think about marine creatures in new ways, particularly those that may contradict conventional ideas about ‘intelligence’, for which, by the way, a definition seems particularly elusive. 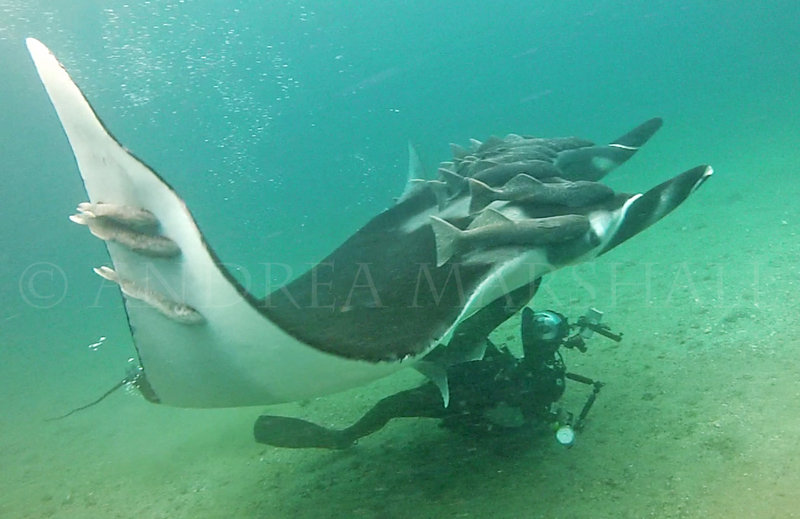 It was for this reason that I decided to share some of my surprising experiences with these rays and my preliminary interpretations of their interactions with divers. Manta rays are of course the largest of the ray species in the world, yet surprisingly we still know very little about these mysterious animals. Indeed, the more we learn, the more impressed we become. What many assumed to be a simple, surface dwelling planktivorous fish has proven to be a stunningly impressive ocean athlete capable of long-distance migrations, impossibly deep dives and navigation through hostile ocean environments. And while all of these other characteristics are indeed impressive, manta rays stand out for me for another reason, a reason that has fueled my obsession with them over the last decade and a half. Manta rays have the largest brain of any marine fish and they are curious towards humans. Now don’t get me wrong, many fish seem curious at times, sharks investigate people, giant grouper eyeball us, often allowing divers to approach within inches of their faces, moray eels are even known to tolerate us manhandling them. But I’m talking about something different, something that goes far beyond that, something deeper. The curiosity that I am talking about results in long extended engagement with humans—interactions that they themselves initiate. Encounter after encounter I am amazed when manta rays ‘hear’ our bubbles underwater and come out of the blue to investigate. They are seemingly unafraid of us, starring at us intently with their large inquisitive eyes. They examine us from all angles as if they are trying to discern what we are or what they can do with us. If the diver is open to it and if they understand what to do, manta rays will allow them to engage in what can only be likened to play behaviour. Sometimes the play can takes the form of ‘cat and mouse chasing’. In these instances the manta will take the lead and I will follow. The manta being the stronger swimmer will have to periodically decelerate, looking back under its massive pectoral fin to ensure I am still there and waiting patiently for me to catch up. Anyone who has even taken a dog on a walk at the beach will know exactly how this experience feels—they are so excited to run quickly down the beach and look positively annoyed when they have to wait for you to catch up!! On other occasions manta rays play by circling around me in the water column repeatedly (even several dozen times) as if I was a nucleus of an invisible atom and they are a giant electron zooming around me from all directions. These types of play interactions may last for a few minutes or they may last for hours. 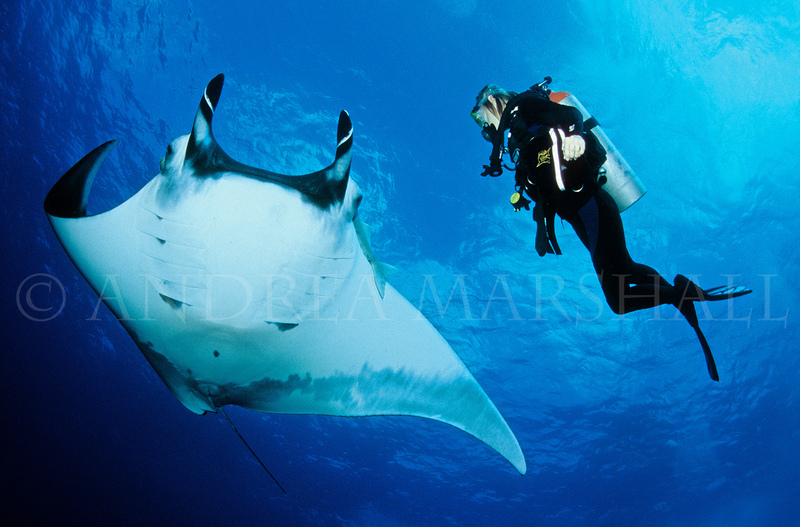 Several mantas can be involved or it can be a one on one interaction with a single animal. 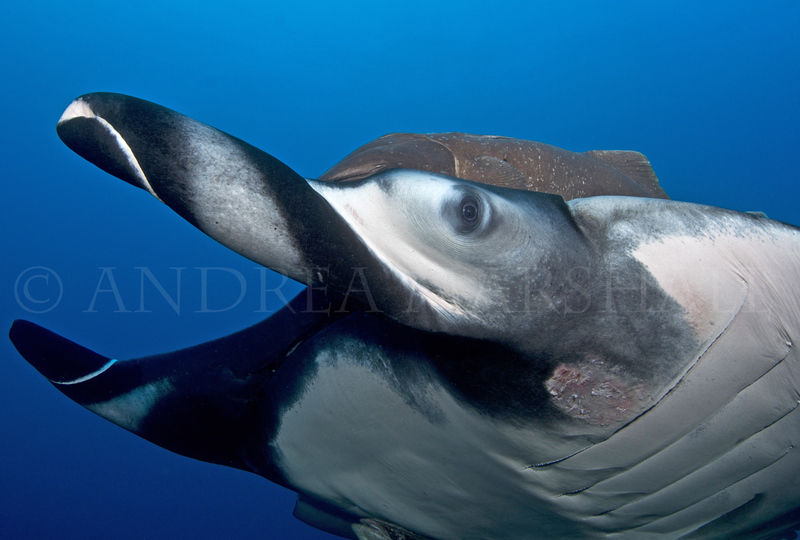 What the manta is thinking or feeling or the purpose of these behaviours is of course unknown to us. Perhaps the most shocking interactions I have had with these gentle giants come during rescues. Entangled or impaled manta rays approach us or allow us to approach them to cut off fishing lines or fishing nets wrapped around their bodies. Their injuries are sometimes severe and they often exhibit large, painful lacerations. Injured mantas have even allowed us to remove parts of spearguns or large stainless steel hooks lodged deep into their flesh. My initial amazement was for their incredible tolerance. Most wounded animals that we encounter, particularly ones in the ocean, quickly move away from divers—a reflex or instinctive strategy to protect themselves when in a weakened state. Mantas respond differently, approaching us when they are inured—slowing their swimming speed, even posing, as if to ask for help. But this is only the beginning of the interaction. 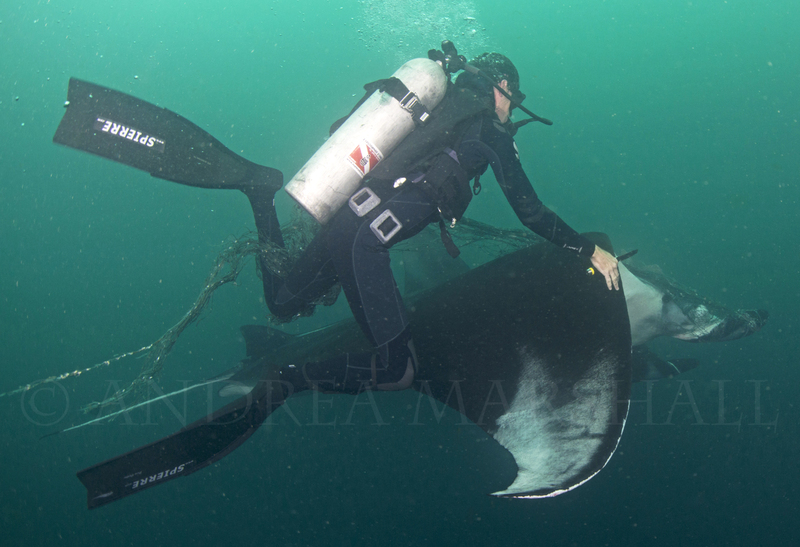 The real surprise comes after the removal of the fishing gear or nets, when, despite its injuries, the manta ray stays to carry on the interaction with the divers that have rescued it. 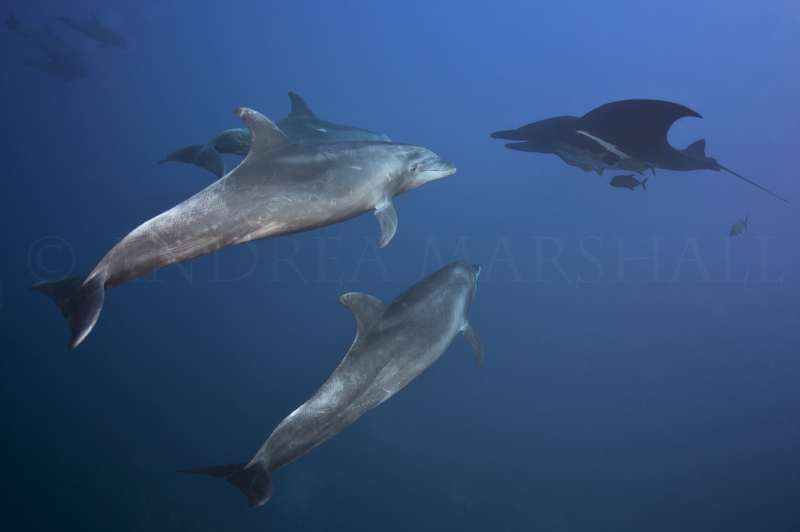 Many times these wounded animals have followed my team members or me up to the surface, even as far as the swim step, and on several occasions lurked about even after we have left the water or have waited for us to return on the following dive. 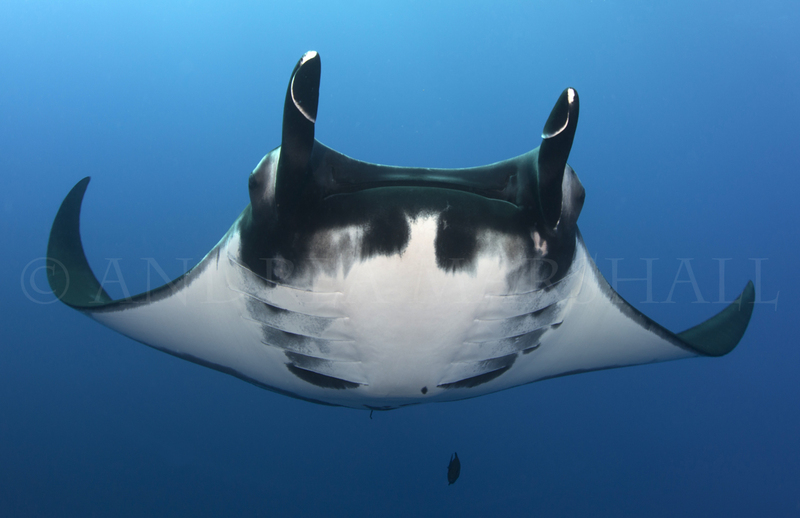 In the thousands of dives that I have had with manta rays I have witnessed things that fly in the face of everything that I was taught about wild animals—that they would innately be wary, shy or reluctant to approach something large and unfamiliar. And it is unusual… in fact, most people would be hard pressed to think of a large terrestrial animal, particularly one that may have never seen a human before, that would walk or run straight up to you, pausing inches from your face to inspect you before rolling over or beginning to play you. As much as we would want it to, this just doesn’t happen in the wild. Not unless the animal becomes habituated to humans or we use food to lure them in. The inquisitive, play-like behaviour in mantas is really only matched by marine mammals, dolphins or whales for instance—social animals known to be amongst the most intelligent non-human animals on the planet. So what does that say about manta rays? Are they as socially complex as these species? What is it about them or about us that allows for these long intimate encounters? Do they approach other animals with the same degree of curiosity? Why do they find humans in particular so fascinating? If queried, many people would claim to have had encounters or experiences with terrestrial animals, both domestic and wild, that leave them convinced of the capacity of animals to think, feel, reason or learn. Not surprisingly few of these individuals would testify they had had a similar experience with a fish. But could these animals be worthy of more credit than we give them? Recent studies have called into question our ability to adequately profile for intelligence in non-human animals, particularly those that are dissimilar to humans—so pretty much anything in the ocean! We are often so keen to measure animals against us that we forget that fair or accurate assessments of animal intelligence may elude our current thinking or be more complex than our present understanding of the term. It is of course easier for us to think of higher order mammals as intelligent. After all, they bear strong similarities to us and we can interpret and compare their behaviour against our own. In all honesty, it goes without saying that many of these animals probably are more intelligent that most. All I am arguing here is that we should not discount the ability of species more foreign to us to display characteristics of intelligence that may be more difficult for us to interpret, understand or account for. The disconnect between humans and the ocean continues to impeded science, impair our imagination and ultimately hampers our ability to empathize with marine creatures. We must continue to fight that natural urge and open our hearts and our minds to the mysterious wonders that lay beneath the waves. I am sure that our increasing knowledge of intelligence and social behaviour in sharks and rays is indeed already stimulating change in the public perception of these creatures, and generating global empathy towards their plight. We have seen how effective this can be in the case of whales and dolphins, and it seems within touching distance in elasmobranchs. With the dedication of groups like Marine Megafauna Foundation in understanding and protecting these creatures, and the fantastic promotion of their cause, more and more people are being persuaded every day. 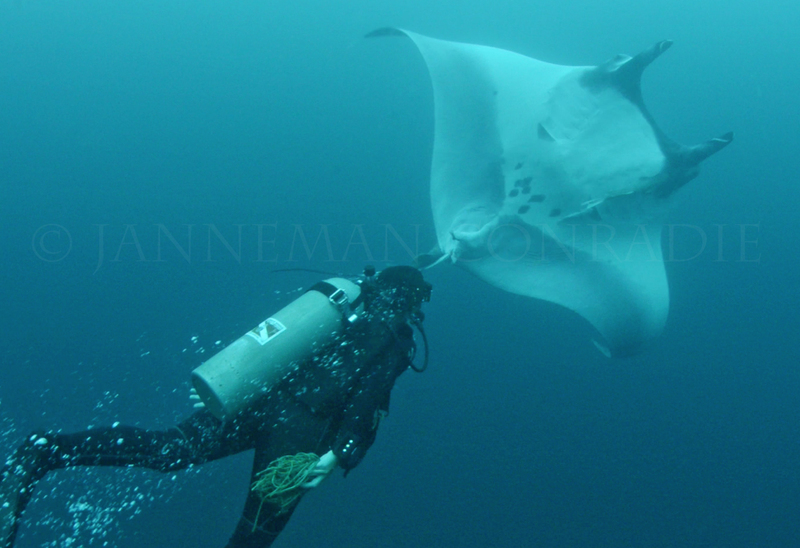 My introduction to mantas happened because I saw your first BBC special, which caught my imagination and created passion within me to see these animals for myself. As you know, I now seek every opportunity to go on your Ray of Hope Expeditions, and to dive liveaboards with manta encounter possibilities. These animals fascinate, amaze, and thrill me. Your charismatic ambassadorship of this species has ignited a worldwide desire to see them, and save them. Your blogs and research continue to create wonder. Your team at MMF and your citizen scientists are enthusiastic promoters of the species. As Rob Perryman above says, more and more people are persuaded every day. I will continue to support marine animals and the ocean in every way that I can! Fantastic blog. Animal intelligence and the need for humans to be more ‘open hearted’ as well as open minded before we can assess intelligence accurately is an issue as fascinating as it is important. If the public could better appreciate the level of intelligence possessed by animals surely that would help them relate and help conservation efforts. Thank you for the article. 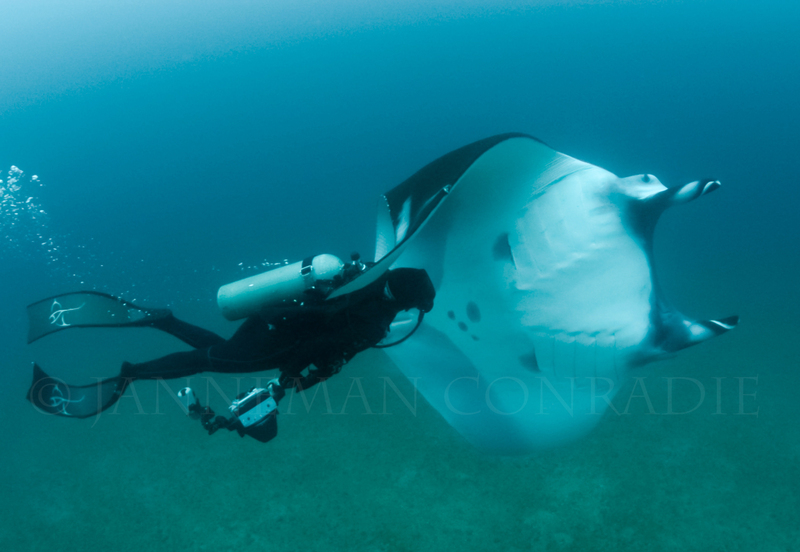 I swam with rays in Mexico (not mantas though). They were very endearing, if a bit “scary”. I was 15 weeks pregnant and I honestly think they knew that. They were very interested in me. They latched on to me and sucked up and down my whole body. About 5 of them. They didn’t do that with the other people. This is why, no matter if I know for certain the animal isn’t as intelligent as a human, I treat it like it is and or smarter. There’s a million different ways you can certify intelligence just because something isn’t smart one way doesn’t mean it’s stupid and should be dismissed. Animals are just like people there’s stupid ones and there’s smart ones. This is most interesting and it is good that readers are adding their particular views on the subject as giant manta behavior is being further investigated.